Track time you spend on projects (beta). Is there a better alternative to Time Tracker? Is Time Tracker really the best app in Personal Info Managers category? 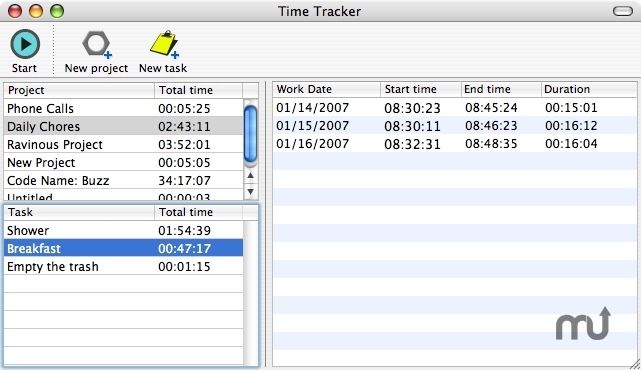 Will Time Tracker work good on macOS 10.13.4? Time Tracker allows you to track the time you spent on projects with this simple and easy-to-use application. Divide your work into projects, and split each into individual tasks. Stay honest, and not count those coffee breaks with the built-in idle time alerts. A menu bar icon reminds you at a glance whether the timer is running and allows you to easily stop and start the timer.